An evergreen shrub. 4 feet tall and wide. The color of this plant is a very beautiful bluish-grey. Its form is stately and it really stands out in a landscaping situation. It is a very important wildlife plant. 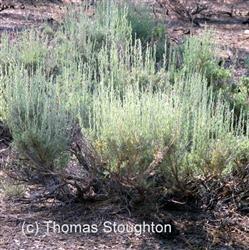 Native to dry areas of the western US. It needs full sun, is very drought tolerant, and needs good drainage. Its seeds are edible. Chewed leaves are said to aid digestion (each to their own). It is nitrogen fixing.